Cleotha Staples, elder sister of Mavis Staples, died February 20th at age 78 in Chicago. “Cleedi” was the first child of Roebuck “Pops” Staples and wife Oceola, and their only child actually born in Mississippi. The family moved to Chicago when Cleotha was a toddler, and went on to fame as gospel and soul singers, whose music became almost a soundtrack to the civil rights movement. They were called The Staple Singers, dropping the ending “s” from their name. 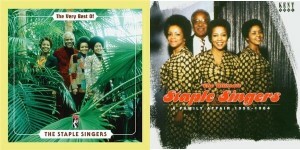 The family band that started singing in church became a gospel sensation with “Uncloudy Day” and went on to greater success in soul and R&B music, mostly with Mavis singing lead, and Cleotha adding harmony, on 1970s songs such as “I’ll Take You There” and “Respect Yourself.” Pops Staples became close friends with Dr. Martin Luther King, Jr., and the group often performed at his events. Cleotha Staples’ singing was a major part of the group’s signature sound. Her voice was a little higher and smoother than her powerhouse-singer sister Mavis. Cleotha has been in poor health for a long time and not performing music, living near her sisters Mavis and Yvonne (who still tours with Mavis) in Chicago. They helped care for her, as they say she had done for them, when they were very small and she was the responsible older sister watching out for her younger sisters.